One of the ways the City preserves the high quality of life in Westlake Village is through taking the initiative in preventing pollution. Westlake Village is within the drainage boundary of the Malibu Creek Watershed. Nearly all of the land in the City of Westlake Village drains into Westlake Lake and Triunfo Creek, eventually making its way into the Pacific Ocean via Malibu Creek through the Malibu Lagoon. The City of Westlake Village, along with surrounding cities and the County of Los Angeles, is proactive when it comes to protecting the quality of our water. Under the National Pollution Discharge Elimination System (NPDES) Permit program, the City is working at cleaning up urban pollution that enters our lakes, rivers and ocean through our storm drains. This is the third five-year cycle of the Los Angeles Countywide NPDES Permit, with the current permit adopted on December 13, 2001 and expiring on December 12, 2006. There are six primary programs that form the Stormwater Quality Management Plan (SQMP) for implementation of the NPDES Permit. The County of Los Angeles has created model programs which form the basis of the City’s current SQMP. This program is designed to get the word out about pollution prevention, incorporating facets for outreach to communities, businesses, corporations, and schools. We need the community’s help to reduce urban pollutants in storm water runoff through simple changes in daily living. Allow swimming pool water to sit for 10 to 14 days and then test for absence of chlorine in the water before discharge. Always throw cigarette butts in trash receptacles. 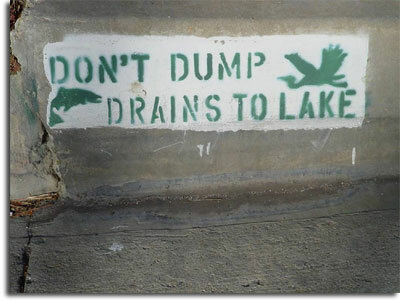 Do not dump anything into the streets, gutters, or catch basins. Do not fertilize or use pesticides near ditches, gutters, or storm drain inlets. Find out more about project pollution prevention on the LA County Watershed Management Division website. Install drip irrigation to reduce water use in your garden. Never apply fertilizer or pesticides right before it is going to rain. Properly maintain your car so it doesn’t drip fluids. Sprinkler water, hosing of sidewalks, and rainwater will carry everything in the streets (grass clipping, motor oil, fertilizers, pesticides, paint thinners, etc.) directly into our lake. Take advantage of locally available Household Hazardous Waste Programs. Find details on the next collection event. Use de-chlorinated pool water to irrigate landscaping. Use organic or non-toxic fertilizers and pesticides. Wash your car at the car wash to keep excess detergents and street trash from entering the storm drain system. Wash your car where the soapy dirty water will drain to a grassy area where the dirt and nutrients (soap contains nutrients) will be used by plants and grasses. When you walk your dog, remember to bring a bag and clean up after it. This program is designed to identify and terminate illegal connections and discharges into the storm drain system. If you would like to report an illicit discharge into our storm drain system or onto any public street, call the countywide 24 hour hotline at (888)- CLEANLA. This program is designed to minimize the storm water quality impacts due to new developments. The program contains specific requirements for developers to follow, including preparation of an Urban Stormwater Mitigation Plan (USMP) to document long-term storm water management through environmentally aware site planning and implementation of facilities to treat storm water prior to discharge into the public storm drain system. This program is designed to minimize the storm water quality impacts due to development construction. The program contains specific requirements for contractors to follow, including preparation and implementation of a Storm Water Pollution Prevention Plan to minimize off-site transport of sediments and pollutants during construction. This program is designed to minimize storm water quality impacts due to public agency activities such as public landscaping, street maintenance and construction projects. In addition to applying all of the development planning and construction requirements to public projects, the City also conducts weekly street sweeping, annual catch basin clean-outs, storm drain stenciling, and routine debris removal from open channels and landscaped areas. This program is designed to advance the educational site visits that were accomplished during the 1996-2001 NPDES Permit cycle into a storm water quality inspection program. The permit requires that the City inspect all restaurants, automotive service facilities, retail gasoline outlets, and automotive dealerships for compliance with discharge prohibitions through proper implementation of storm water best management practices. The inspections are to occur twice during the five year permit cycle, with the first round of inspections to occur no later than August 1, 2004.